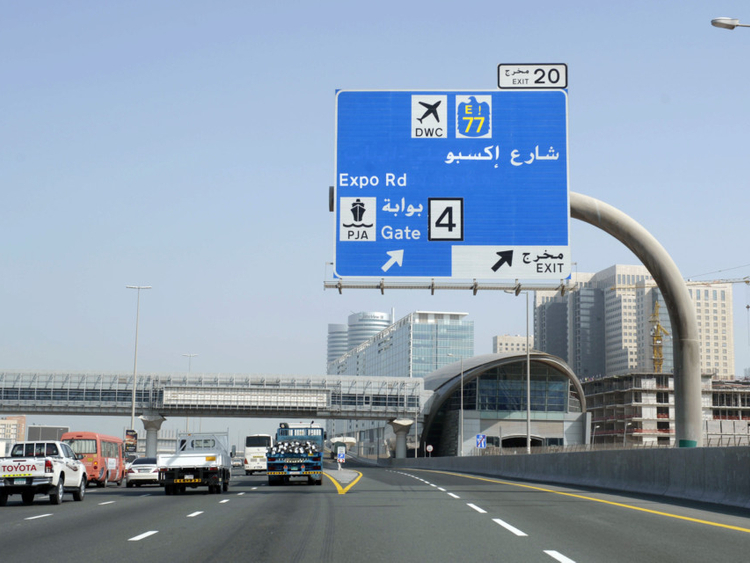 Dubai: A 15-kilometre long highway leading to the Expo 2020 site in Jebel Ali has been renamed Expo Road. Shaikh Mohammad Bin Rashid Al Maktoum, Vice President and Prime Minister of UAE and Ruler of Dubai, ordered the renaming of the highway which was earlier known as Jebel Ali-Lehbab Road. “Expo Road is a vital traffic corridor in the roads network of Dubai. It offers an alternative route for motorists heading to Jebel Ali Industrial Area and the surrounding areas. It also serves motorists heading to or coming from Abu Dhabi without passing through the downtown area,” said Mattar Al Tayer, Director General and Chairman of the Board of Executive Directors of Roads and Transport Authority (RTA). Expo Road serves several hotspots such as Jebel Ali Industrial Area, Jebel Ali Free Zone Authority, Dubai South and Dubai Investment Park, extending all the way to the site of Expo 2020. “RTA has carried out several projects to improve traffic flow on Expo Road; which starts at the Interchange of Shaikh Zayed Road and connects with Emirates Road,” said Al Tayer. Recently, RTA completed improvements of roads around Expo 2020 site including widening lanes from four to six in each direction, constructing four junctions on Emirates Road, Shaikh Zayed Bin Hamdan Al Nahyan Road, Shaikh Mohammad Bin Zayed Road and Al Asayel Road. “Among the recent upgrades include six bridges on service roads parallel to this corridor, in addition to a flyover of 24 bridges at the junction of Expo and Shaikh Zayed Roads (Eighth Interchange),” said Al Tayer. The new name of the road will reflect on all the 68 directional signs, including 18 large signboards. Being held for the first time in the MENA and South-East Asia region, the World Expo will take place in Dubai from October 20, 2020 to April 10, 2021. The event is expected to attract about 25 million visitors, 70 per cent of whom are expected come from abroad.